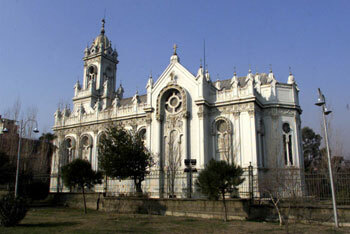 The Bulgarian St Stephen Church in Istanbul is also known as the Bulgarian Iron Church. This church belongs to the Bulgarian minority. The Bulgarian minority of the Ottoman Empire used to pray at the churches of the Fener Orthodox Patriarchy. Due to the nationalistic movements, Bulgarians were allowed to build their own church in the 19th century. First, a small wooden church was built on the shore of the Golden Horn between Balat and Fener squares (near Eyup district) where the current church is located, but later this was developed into a larger building. An iron frame was preferred to concrete reinforcement due to the weak ground conditions. The construction plans were prepared by Hovsep Aznavur, an Armenian of Istanbul origin. An international competition was conducted to produce the prefabricated parts of the church. An Austrian firm, R. Ph. Wagner, won the competition. The prefabricated parts were produced in Vienna and transported to Istanbul by ship through the Danube and the Black Sea. After one and a half years work, it was completed in 1898. The main skeleton of the church was made of steel and covered by metal boards. All the pieces were attached together with nuts, bolts, rivets or welding. The architectural styles come from the Neo-Gothic and Neo-Baroque periods. The richly ornamented church is a three-domed cross-shaped basilica. The altar faces the Golden Horn and a 40 m-high belfry, the six bells of which were cast in Yaroslavl, rises above the narthex. The church belongs to the Bulgarian minority in the city. The Bulgarians of the Ottoman Empire used to pray at the churches of the Phanar Orthodox Patriarchy, but due to nationalistic movements, Bulgarians were allowed a national church in the 19th century, the Bulgarian Exarchate. Initially, a small wooden church was erected on the shore of the Golden Horn between Balat and Fener squares (near Eyüp district), where the current church is located. A house was donated by the statesman Stefan Bogoridi and it was reorganized as a wooden church. It was inaugurated on 9 October 1849 and became an important site of the Bulgarian National Revival. The Ottoman royal decree of 28 February 1870 establishing the Bulgarian Exarchate was first read in the church. After the original wooden structure suffered from a fire, the larger current building was constructed at its place. An iron frame was preferred to concrete reinforcement due to the weak ground conditions. The construction plans were prepared by Hovsep Aznavur, an Armenian of Istanbul origin. An international competition was conducted to produce the prefabricated parts of the church, won by an Austrian company, R. Ph. Waagner. The prefabricated parts, weighing 500 tons, were produced in Vienna in 1893-1896 and transported to Istanbul by ship through the Danube and the Black Sea. After one and a half years' work, the chuch was completed in 1898 and inaugurated by Exarch Joseph on 8 September that year. The main skeleton of the church was made of steel and covered by metal boards. All the pieces were attached together with nuts, bolts, rivets or welding. In terms of architecture, the church combines Neo-Gothic and Neo-Baroque influences. St Stephen was the product of 19th century experimentation with prefabricated iron churches. The British, who invented corrugated iron in 1829, manufactured portable iron churches to send to far-flung colonies like Australia. The Eiffel Tower's creator, French engineer Gustave Eiffel, designed iron churches that were sent as far as the Philippines and Peru. Now St Stephen is one of the world's few surviving prefabricated cast iron churches. In addition to the St Stephen Church, there is another Bulgarian Orthodox church in Istanbul — the St Demetrius Church in Feriköy.